On behalf of the Pacific Coast Cruisers and myself, I would personally like to thank you folk so very much for the wonderful hospitality shown by you folks and your staff. It was remarkable. I have been on many many trips and I can honestly rate this one as one of the best. PS: Tell Meagan, she is my favorite waitress. It truly takes a lot to have ME at a loss for words, but she did it. 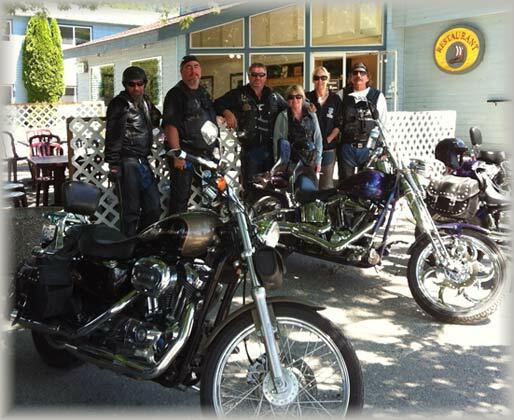 Just wanted to say thanks for an enjoyable stay and your help in outlining the wonderful rides around the Kootenays. We covered all the roads we wanted to, most at least twice. We really enjoyed our first trip into the Kootenays and will definitely be back. Thanks again, have a great summer in New Denver.